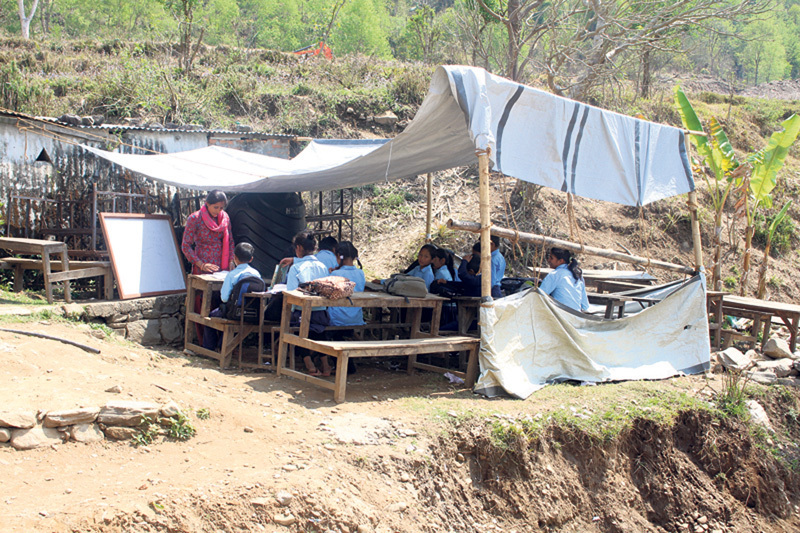 Students in a temporary classroom at Nimel Primary School of Saurpani, Gorkha in this photo from March/ Republica. Education is the constitutional right of every Nepali child yet a large number of children are still deprived of it because of government negligence. The 2015 earthquakes resulted in big disparities in educational outcomes between affected and unaffected schools. According to government statistics, over 8,600 schools were destroyed in 14 most-affected districts, hampering the studies of around 1.2 million children went to those schools. When they have to compete with students of ‘privileged’ schools in the open job market or in higher education, they will certainly lag behind, and for no fault of their own. Nearly two and half years after the devastating earthquakes destroyed these schools, the government has done little to normalize the situation. While several private schools have been reconstructed with private funds most government schools are in battered conditions. Many others—like the Darbar High School in Ranipokhari, Kathmandu—still lack funds to clear the debris. About 3,000 Transit Learning Centers (TLCs) were built in the affected districts, serving as temporary shelters with walls and roofs made of plastic, straw, bamboo or zinc sheets. But TLCs are small and cannot accommodate all students. So students often have to study under open skies, which means classes cannot be conducted during the rainy season, as well as on particularly hot or cold days. Even these centers have worn out, and they might collapse any time. Half the students in affected areas are girls. As they are not attending schools, they are being trafficked from quake-affected regions like Sindhupalchok, Rasuwa, Dhading and Nuwakot. Large number of girls from these areas are brought to urban centers to work in restaurants and dance bars, or trafficked abroad. According to the National Human Rights Commission, after the earthquakes, trafficking of girls below 18 shot up by 15 percent in these districts. Nepal Police says trafficking from these areas could have increased by as much as 150 percent. Education could have made these girls more aware of trafficking. But they have not been able to attend their battered schools. Besides the girls, even the physically and mentally challenged children are dropping out at alarming rates. Yes, some donor agencies have come to their aid and also helped with reconstruction of damaged schools. But they have not been able to do as much as they had committed to. The Japan International Cooperation Agency (JICA), for example, had committed to rebuild 283 schools but has completed only 83 so far. Likewise, the Asian Development Bank (ADB) had committed to rebuild 175 schools but has done only 84. The government initiative is even more worrisome, so far rebuilding less than 50 schools. 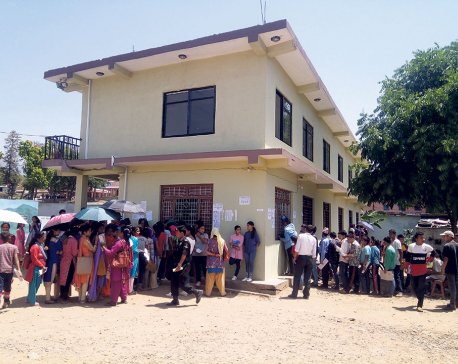 Rural students had been faring badly even before the earthquakes. In 2014, 93 percent students from private schools passed SLC exams while only 28 percent from public schools did. This gap is going to widen in the coming years as schools in affected districts await reconstruction. Lowering of educational budget has also hindered reconstruction. At least 15 percent of total budget used to be allocated for education. This fiscal, this has come down to 5.2 percent, an annual decline of 38.4 percent. Education budget has been diverted to establishment of new federal units and salary of local government staffs. This is a big setback to education sector, and schools of affected areas in particular. Since the government has committed to spend at least 20 percent of budget on education in various international forums, the donors should be constantly reminding it to live up to this commitment. According to the Post Disaster Recovery Framework, US $167 million is needed for school reconstruction and yet only $53 million has been set aside for the purpose. It is uncertain if and how the remaining $ 114 million will be put together. Even donors that pledged to support school reconstruction are helpless without government initiative. We are talking about the fate of 1.2 million children of affected areas. It is vital that all the damaged schools are soon rebuilt, and books and educational materials delivered to them on time. For this, the government should increase educational budget to 20 percent of the total, as it has committed to do with the international community. Perhaps, then, the donor agencies would also be tempted to complete their unfinished business.